Monday mornings can be such a controversy. Monday’s are the start of a usual work week. While some are waking up dreading having to attend work others are anticipating on what great things are to come this work week. Ideally no one would drop a free day to have to work but if we enjoy were we work we enjoy going to work! When motivating your employees it should start from the minute you walk into the door. As management you should provide a pleasant atmosphere for your employees. Having some one at the door greeting your employees with a simple “Hello, Good morning” can go a long way. It doesn’t just stop there it continues through the work day. You want your employees feeling excited and happy, knowing that their day will be stress- free. Employees are real people that deal with real live stress everyday. Work should be a place where they don’t have to deal with stress. Another incentive that gives your employees motivation is; making sure that your employees have a spacious environment. Somewhere they are able to move around with fresh air and natural light. It’s very important to have lots of windows to give off that natural light so your employees don’t feel cooped up. Having that room gives them opportunity to spend an appropriate amount of time with other employees. As well as giving them the space in the kitchen or cafeteria to lounge on breaks; a place where the coffee and tea is always stocked. In addition to being resourceful with your space using your walls can be another great idea. Make sure you have an employee bulletin board to post events, birthdays, and motivational slogans. You may also want to post your company’s progress to encourage your employees to work hard. 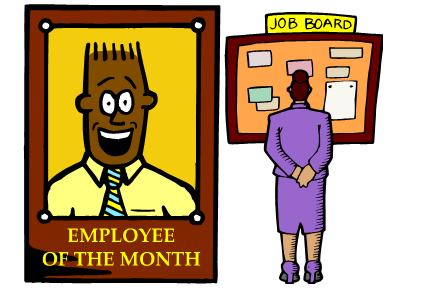 Add a recognition section to your bulletin board to recognize outstanding employees no matter small or big. Remember that whether you post something psychically or just take a walk over to your employee’s desk to tell them what a great job they do or done it’s guaranteed they will continue to work hard and they will strive for more. Motivating your employees isn’t just about the work they do but about them as an individual. A great way to get to know your staff a little better and to keep them excited about coming to work are events! There are many events you can do as a company. Many include food, such as a pizza day, cupcakes for employee birthdays, international food day, etc. This not only feeds your employees but gives them the chance to be social with one another. Don’t forget that that is another important aspect in the workplace; employees should know how to work as a team and be social with each other. Some more social events include having a casual dress day, dressing up for holidays, creating a softball or bowling team, etc. Lastly but not least recognizing your employees and the work they do will always keep them motivated. Whether it be getting to know them on a personal level, complementing their work ethics, or rewarding them. You are able to do this by social interactions or simply going to your employee’s desk to see how they are doing. Another example can be setting up contests or incentives to a reward for the fastest or the most sales by the EOM. As employers we should never forget that the employees contribute to a company’s success. I think its important to build a rappore with you employees. Take an interest in what they want to share with you. A verbal acknowledgement to your employee in recognition of their good performance will always get its just rewards. There are many jobs out there where a paycheck is not enough motivation for an employee. It’s always a good idea to recognize and motivate your employees. I just had a pizza lunch with my team to thank them for all they do. It was just a casual lucnh meeting but we got to talking and all kinds of great ideas starting flowing! I was trying to motivate them but really we ended up motivating each other. I agree with Kevin, sometimes employees need a bit more than just a pay check.